In the year 2035 people live underground. The surface can kill them due to the deadly virus unleashed decades ago by the Army of the 12 Monkeys, a radical group. Cole (Bruce Willis) is a prisoner within this new order and is volunteered to time travel and stop the Army of the 12 Monkeys from ever occuring. With stellar performances from Madeleine Stowe as the psychiatrist called in to treat Cole after he arrives in our present dazed and disillusioned, to the unnerving antics of Brad Pitts mental patient character obsessed with Cole, 12 Monkeys is an amazingly dark ride into a not so impossible future. 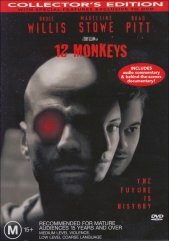 Directed by the venerable Terry Gilliam (Fisher King), 12 Monkeys is a thinking man's action movie, suspense and drama rolled into one. 12 Monkeys begs the question: Who really is the Monkey, them or us?